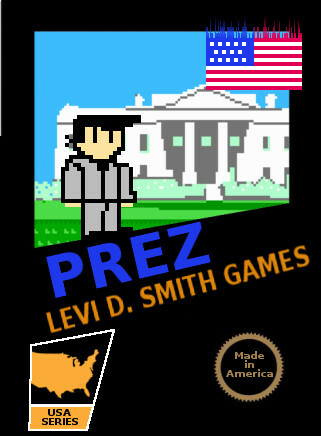 Prez is the second NES (Nintendo Entertainment System) game that I’ve developed, which was for the MiniLD #71 “Retro Challenge”. 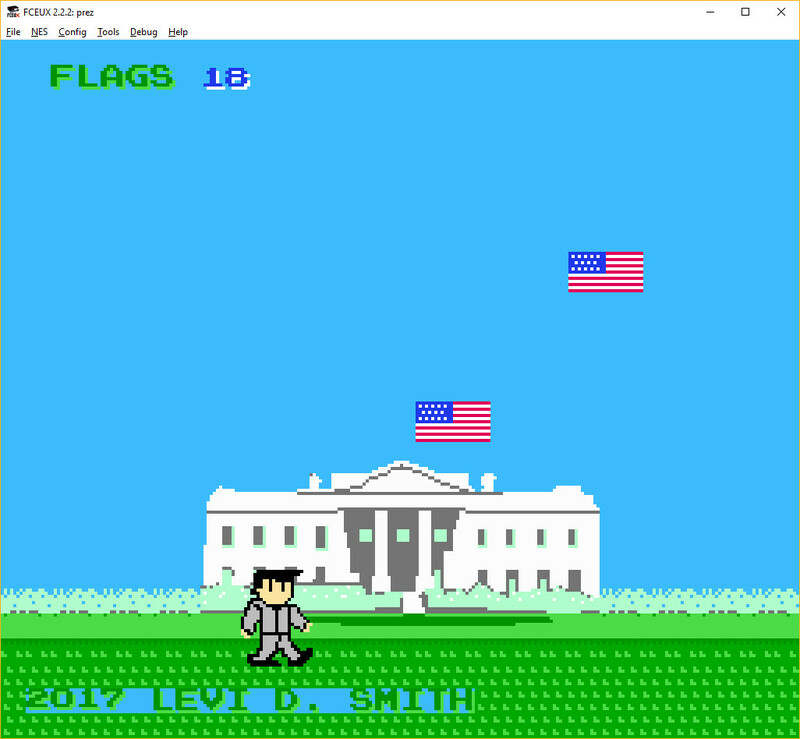 You play as Prez and must collect the flags as they fall from the sky. My first NES game was a very simple space shooter called Space Dude, which I created back in April 2014. I tried a few new things for this game, such as using multiple palettes and using “random” values to position the flags. Runs well with FCEUX 2.2.2. I haven’t tried other emulators. – Added speed variable (just one or zero) which tracks if the player is standing or walking. If standing, the animation loop isn’t played. – Due to the vertical scroll fix, I pushed the remaining tiles down one row. I was surprised that this made the ground in front of the White House look much better, since it moved the ground to the attribute block with the green grass palette. – When a flag falls below a certain Y coordinate (defined with a constant), it resets to a “random” position at the top of the screen. Previously, the flag would just loop back to the top of the screen after the Y position value rolled back over from #$FF to #$00. Download the latest version of the NES ROM at NESDev. View the Prez development video archive.